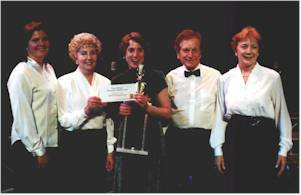 The Connecticut Master Chorale won First Place in the McDonald’s Gospelfest 2001 Competition held Sunday afternoon May 27 in Stamford, bringing home a huge trophy, a check for $1,000 and an afternoon full of exciting memories. "The Master Chorale is not focused on Gospel music, so we weren’t quite sure how we’d be received," said Tina Johns Heidrich, Founder and Director of the group of 55 Danbury area singers. "I don’t think the audience knew what to expect as we took the stage. But once we began singing we could hear excitement building in the audience and that encouraged us to do our best. When we finished they were on their feet hooting and hollering. What a rush!" The judges and audience loved it. They were clapping and yelling and dancing in the aisles. Some audience members lifted their kids and were swinging them in the air. "Until Sunday I didn’t know what Gospel music was all about. I learned for one thing that it’s an audience participation event," said chorus member Nancy Lavers. "They embraced us – and they loved us! They really loved us!" Featured in the first half of the program were inspiring performances by renowned Gospel performers Melba Moore, Cissy Houston, Tremaine Hawkins and Hezekiah Walker. The event was hosted by Percy Williams of New York’s KISS FM. "The Connecticut Master Chorale performs the great masterworks plus an eclectic repertoire, and in a span of two months we went from Dvorak to Handel to Gospel." said Heidrich. The Gospelfest Competition is an annual event sponsored by McDonald’s and local McDonald’s Restaurant franchise owners. The competition includes several Gospel genres and the Master Chorale took first place in the Adult Choir category. Other categories include Soloists, Praise Dancers, Christian Rappers, Steppers, and Youth Choir. The Connecticut Master Chorale was one of twelve finalist groups selected from an entry field of 2,179 in the Tri-State area. The Chorale sang in the final competition held before a packed Palace Theater in Stamford on Sunday May 27, and the entire event was recorded and broadcast on ABC7 on Saturday July 14. 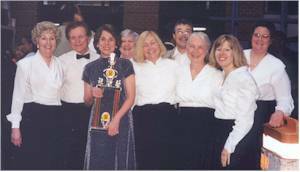 The Connecticut Master Chorale also took first place the following year, in McDonald's Gospelfest 2002.